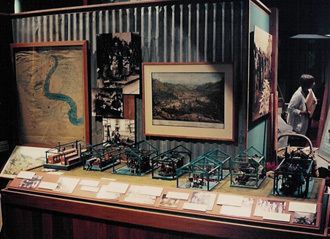 The completed exhibit features the enhanced diorama. 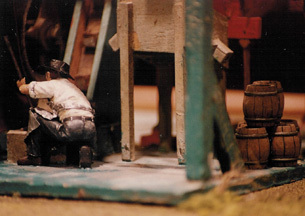 Features: Diorama using see-through models of the machinery used in the 19th century powder mill, demonstrating the process of making black powder. 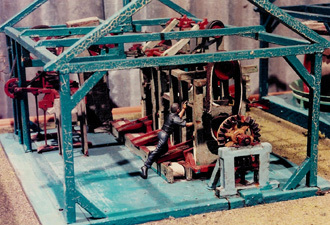 Figures added to indicate diorama scale and to help viewers understand the size of the original machinery. Before repairs, some model pieces were broken and scattered. The Challenge: Working as a subcontractor to the South County Design Center, the exhibit designers for the development of this new museum, we inventoried the model for damage and any missing black powder manufacturing process elements, as well as investigating the potential for making the model "work" again - push the button and watch the machinery run. 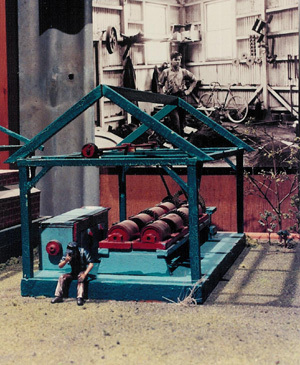 The overall goal was to develop a dynamic exhibit about the powder mill as a piece of local history, utilizing this model in a diorama that would serve as the centerpiece of the exhibit. All, of course, within a limited budget. This required research as to exactly how the process for producing black powder was done. After being in storage for several years, the once interactive display proved to be impractical to resurrect as a "working model". 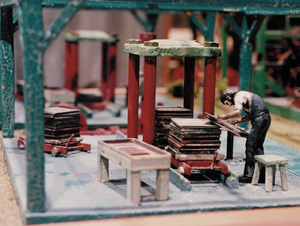 In the finished exhibit, the fixed up machinery sheds are enhanced by the addition of landscaping and 24th scale (3" tall) workers (this one mops his brow) as well as historical images and text panels which combine to complete the story. The Solution: The client accepted our recommendation against any attempt to get the model to "work" as it was too fragile and would be "down" too much. Instead, we removed the process buildings from the original base, repaired the damage and touched up the paint. We then reconfigured the arrangement of the process buildings, lining them up in the order of each actual process step rather than the original random placement of each process machine, the locations dictated by the necessities of connecting each one to the series of pulleys and belts from under the original base. In order to add some life to the scene we provided a suggestion of landscaping - turf, bushes, a tree or two - as well as some dynamic scale figures actively involved with the huge processing machinery to give a sense of scale and energy. The finished exhibit's presentation was enhanced with historical photos of the process and explanatory text to tell the story. 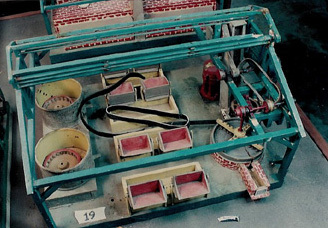 A worker checks the crushers before starting a new run of material. The powder mill was only one of several types of mills that made use of the hydro power of the Santa Cruz River. A worker loads squares of pressed black powder onto a cart, then to be pressed again. Explosions were common. The machine sheds were largely wood framed with two flimsy sides that would easily blow off the framework when explosions occurred, limiting both damage and injury. Machine tender's aprons were typically coated in a shiney layer of gun powder dust, like graphite. Creating this figure's apron of thin lead foil successfully represents the right shiney look, as well as promotes the appearance of weight in the way it can be draped.